Songs from the North can be credited for its ambition, even as its ambition undercuts the uniqueness of its composite parts. If there is one flaw with the Finnish doom metal band Swallow the Sun's 2012 opus Emerald Forest and the Blackbird, it derives somewhat from the word "opus" itself. At a portentous 67 minutes, the album is a lengthy journey into the iciest gales of winter, with suite-like pieces (the title track) and ominous poetry readings ("Labyrinth of London", which quotes William Blake) forming a captivating sonic landscape. In his review of the LP, Angry Metal Guy argues that Emerald Forest has "enjoyable parts, [but] too much whole," writing, "Ultimately Emerald Forest and the Black Bird is a good record that just gets weighed down under a band’s inability to edit itself." In this critic's opinion, Emerald Forest does run a bit weary during its midsection ("Silent Towers," "Of Death and Corruption") but on the whole it finds these Finns writing the best music of their career. From the compelling light/dark contrast of lead single "Cathedral Walls" to the moving melancholy of "April 14th", Emerald Forest covers every element of the Swallow the Sun sonic: crushing riffs, brooding romantic poetry, and an inviting wintry atmosphere. That the record could have been trimmed by five minutes or so is a legitimate point, but not one so substantial that it diminishes the record's overall achievement. Angry Metal Guy's point about Emerald Forest is fair, and it highlights an area of potential improvement for the band. It's been three years since Emerald Forest, and on the matter of self-editing, Swallow the Sun has decided to double down on the lengthiness of that record -- or, rather, triple-down. 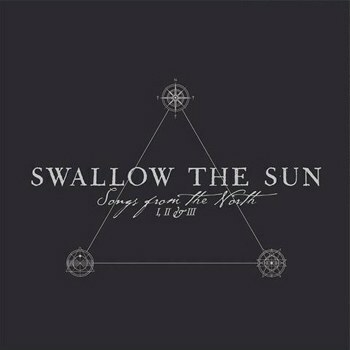 With Songs from the North Swallow the Sun has crafted a staggering triple LP, with each LP representing a distinct shade of the group's sound. Songs from the North I and Songs from the North III are two takes on doom metal, with the former more in line with the well-established Swallow the Sun style and the latter an expansion of the band's funeral doom bonafides. Funeral doom has been a part of Swallow the Sun's music since its debut, 2003's The Morning Never Came, but never has the band committed to writing the kind of plodding epics that funeral doom is so well known for. With III, Swallow the Sun steps up to that plate, revealing itself to be a natural at what is a fairly tricky compositional mode. It's not easy to make plodding drum rhythms and sludge-slow guitar riffs compelling when stretched out across ten minutes or longer, but these guys are more than up to the task. Sandwiched in between the melodic doom of I and the glacial funeral doom of III is the introspective II, a collection of songs akin to Opeth's Damnation or Katatonia's Dethroned & Uncrowned. Taken one way, II is Swallow the Sun's "acoustic album": there are no growls, the electric guitars aren't turned up to their usual bludgeon. This allows the group's skill in crafting memorable choruses -- a rarity in doom metal of this kind -- rise to the fore. "Heart of a Cold White Land" is especially memorable here: "This heart of a cold white land / In the dark of the endless night / And the light of summer that never dies in these songs from the north". Although the arrangements of II are lush, in comparison to pieces like "April 14th" its songs do constitute a breather in the Swallow the Sun discography. With its distinct composite parts, Songs from the North is something of a manifesto for Swallow the Sun. In deciding to break up this LP into three sonic variations, the band makes it clear what the core parts of its songwriting are, inviting listeners to delve into each aspect at some length. But while Songs from the North has its powerful moments, here I must invoke the words Angry Metal Guy used to describe Emerald Forest: "enjoyable parts, [but] too much whole." The decision to place II and III in the context of a triple album is a risky one. Because those two LPs represent new ventures for Swallow the Sun, the band puts viewers in the position of experiencing these records as parts of a gargantuan whole, rather than as unique deviations from a previously established norm. On its own, an album like III is an excellent addition to the Swallow the Sun catalogue; it need not the structure of Songs from the North in order for it to make sense. The same goes for II, which is a lovely if familiar experiment for the band. Swallow the Sun has never released a "stripped down" LP before, but its prowess with acoustic and atmospheric interludes is well established by this point. As such, II represents a refining of an already existing feature in Swallow the Sun's repertoire rather than an outright expansion in the way III is. Still, II and III are interesting enough as experiences that it would have been reasonable, if not expected, for the group to release them as standalone albums. By linking new experiments like II and III with the par-for-the-course I, Swallow the Sun diminish the individuality of the former two. To be fair, as a "normal" Swallow the Sun record, I has a lot to live up to; Emerald Forest is the apotheosis of the group's style at this point, and following it up is a difficult task even for musicians as adept as these. I is a good but not great outing, which makes getting through the remaining hour and a half of music a challenge, despite the many brilliant moments therein. Fortunately, because Swallow the Sun is of such a high caliber, even an experience as overstuffed as Songs from the North features some standout moments. The earth-rumbling "Empires of Loneliness" (III) deftly uses booming horns in the background to further drive home the sledgehammer punch of the guitars. Church organs perform a similar function on "Abandoned by the Light", also on III, which is one of the frostiest tracks Swallow the Sun have ever put to tape. On the lighter end of the spectrum, instrumentals like "Womb of Winter" and "66°50´N,28°40´E" (coordinates of Salla, Finland) on II let the group show off its compositional prowess. Frontman Mikko Kotamäki is a solid vocalist, one able to convincingly alternate between gutteral doom growls, shrill black metal screams, and smooth (if a bit warbled) clean vocals, but it's nice to hear the instrumentalists in the band take center stage, given their aptitude at crafting vivid sonic tundras. As a whole, Songs from the North is not a case of failure but of overreach. There is no reason why any of these albums could not have been released in a standalone fashion, nor does their presentation here reveal why they had to be made into a triple LP release. Ostensibly, these three recordings are meant to signify the totality of the Swallow the Sun approach to music. However, Emerald Forest is a magnificent encapsulation of the group's style, and it does so in just over a third of the time that Songs from the North takes to make the same point. Part of the former album's success is that it seamlessly integrates the moving parts of Swallow the Sun's repertoire; the latter, by contrast, offers up each part plainly individuated and expanded. Simply put: it's not that there isn't anything to love in Songs from the North -- there's plenty, especially on II and III. Instead, the listener is given far too much. With such excess, "too much of a good thing" though it is, diminishing returns are bound to follow.